Talking about ways to help our children with autism on Carrie Clark's The Speechie Show was a blast! If you didn't catch me live, you can watch the replay on her blog. I show you some of my most favorite visuals and when I would use each! So, if you are new to my site, welcome! And if you've been here for a while, I'm thrilled that you are reading my blog as a regular! 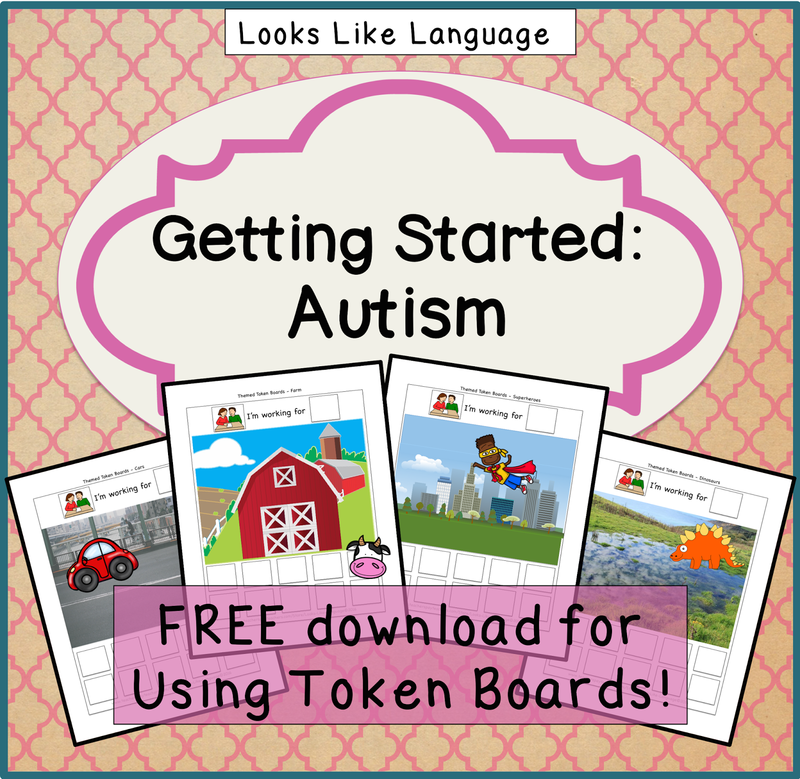 I hope that you signed up for my Getting Started with Autism Free Guide. If you lost the link, just click here. Once you've signed up with your email, you will have immediate access. I promise to keep your email private! 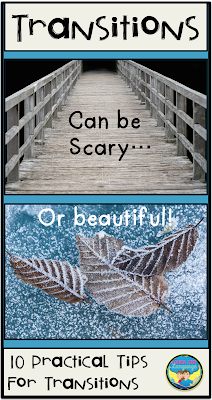 As a special bonus, I've added a free download of a choice board to add to your set of visuals! It will come in my next newsletter for all of you who have joined me. Since I truly believe in visuals, I wanted to provide you with a blog post that summarizes the main tips I have for how to use them. See, we all need visuals! Tip: If you haven't read my post on questions to ask yourself to start problem solving behaviors, you might want to start here. * Visuals are a great asset, but they need to be taught. They are not an automatic cure. Start with basics and expand from there. * When teaching a visual system, that is the new skill. Whatever you are having the child do during this instruction should be something that is easy and already learned. * You need to be sure that you are using the level of symbols that your student understands: objects, photos, icons or words. * Doing a trial of matching the symbol to the object is one way to start assessing the student's comprehension of the symbol level. * For students who use pointing boards, AAC or PECs exchanges, you can try having alternative symbol levels available and see which type they use to request. It is usually safe to assume that children will choose what they understand and are comfortable with. * Another way is to let them request and tell them "Take it." Did the symbol they used to request match the item they took? You know that they took what wanted! 1. If your low functioning students are new to visuals, the best place to start is with an activity that has 'all done' built in, so that the way to do the task and how to know it is completed is built right into the task. One idea is to use work tasks, like puzzles, sorting or placing clips on cards. Students see what to do and know the job is done when all the pieces are used up. The task disappears and some type of reinforcement is given. But how to add language based skills into this? 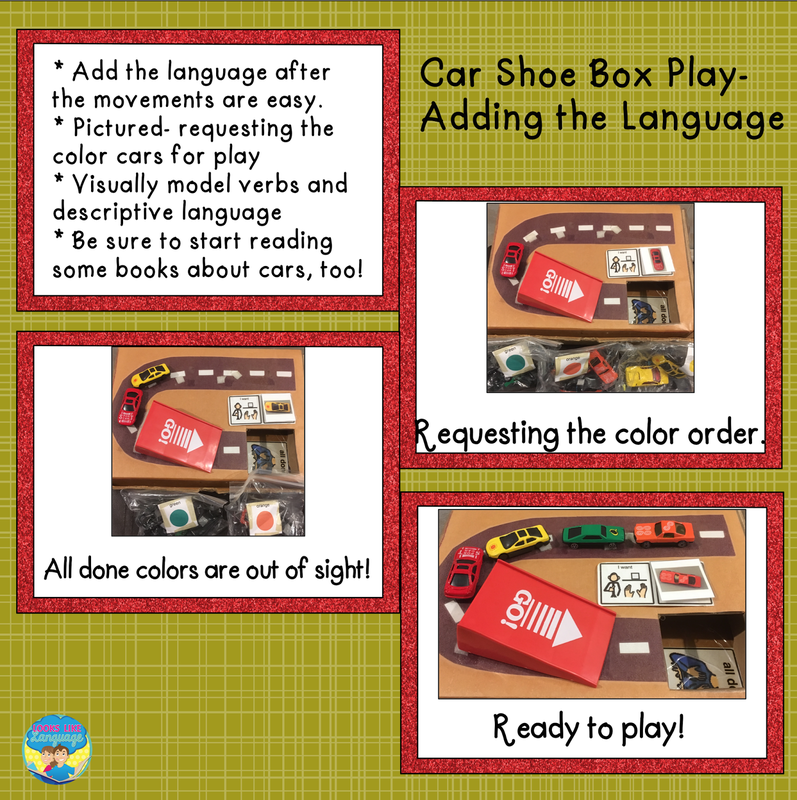 I used a variety of play tasks with a shoebox to help my students develop realistic play using common objects, with symbols to support the language. You can see more about this one in this post. 2. 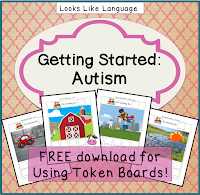 Using token boards, like those you got in the Getting Started with Autism Guide, is the next step for showing students how much work is expected and when they will be done. Students need to have some symbolic communication skills for token boards, since they request what they want to work for, and the tokens symbolize a piece of the task that they are completing. If your students have limited attending skills, only use the number of tokens that they can handle successfully. Really! Even if it only one token. (Just place all but one of them in the picture, leaving the last token in the lower right hand bottom corner for them to finish before getting their request.) And don't forget to make the activity a simple one, even an enjoyable one! Keep it positive and work on increasing the amount of work they can complete at one time. 3. A First-Then board is useful when students can do a complete activity. First, they do the work you are requesting of them, then they get their choice. Again, when first using a new visual, keep the requested work short and easy so that they can experience what the new visual means in a positive way. Even when students are capable of using longer schedules, a First-Then board can be useful to help a student get through some hard work. We are all willing to put in more effort on a difficult task if we know that it is for a short time, followed by a rewarding break. Coffee, anyone? 4. 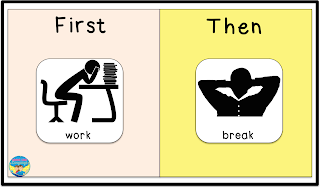 Visual Schedules help students see what is coming next, reducing anxiety and showing them what they need to do to get their break. 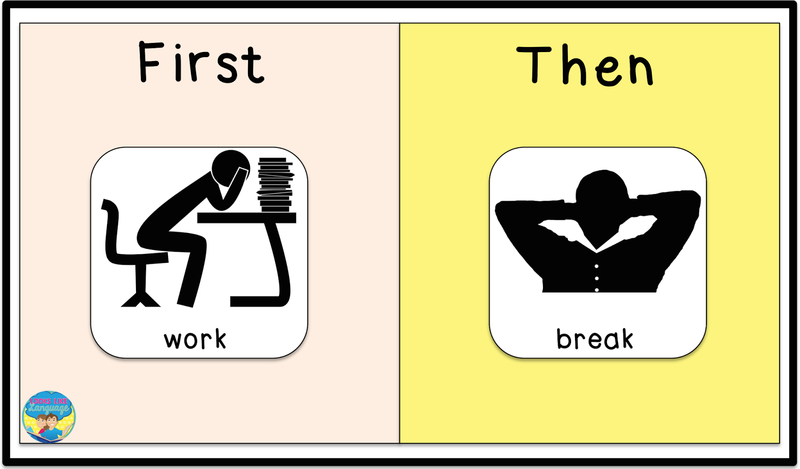 When students can use first/then boards with two activities in the 'First' section, you can start with a visual schedule. 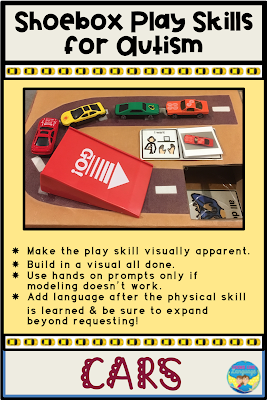 There are generic symbol cards in the free download, but you may do better introducing a visual schedule with photos of familiar activities that you student knows how to do. For example, the schedule might show: puzzle, bubbles, students' request, book, play dough, student's request. To learn the schedule, the activities are easy and the breaks are frequent. I love having the all done pocket on a schedule so that students can check their schedule and place the completed activity in the pocket. Done= out of sight! Read more in this post. If you just place a schedule on the wall and don't teach its meaning, it is just a bunch of paper on the wall! 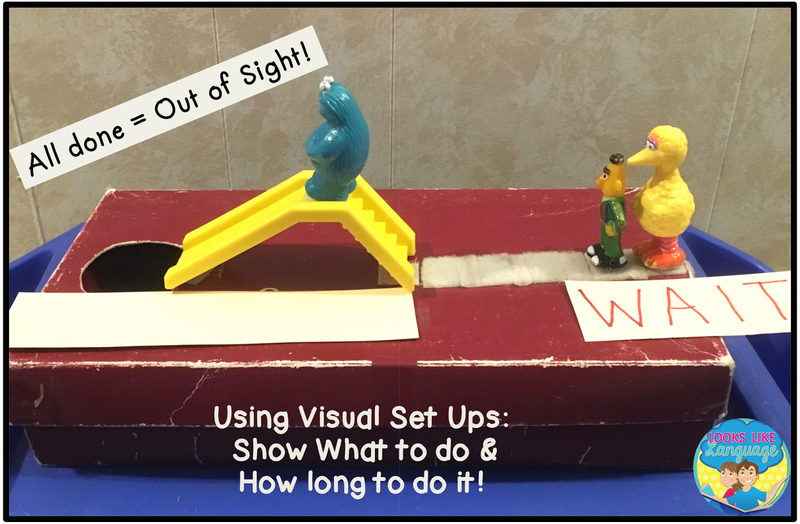 The same goes for all of the visual supports that can be so helpful, so be sure to take the time to make them meaningful for your students! 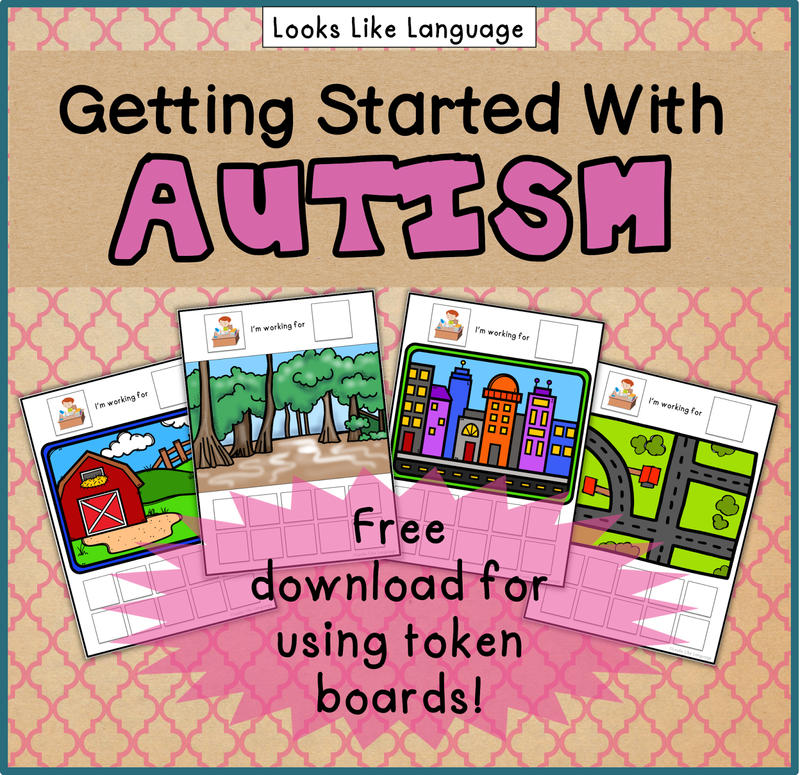 I hoped this helped you to be able to start effectively using your free Getting Started with Autism Guide! Any questions? 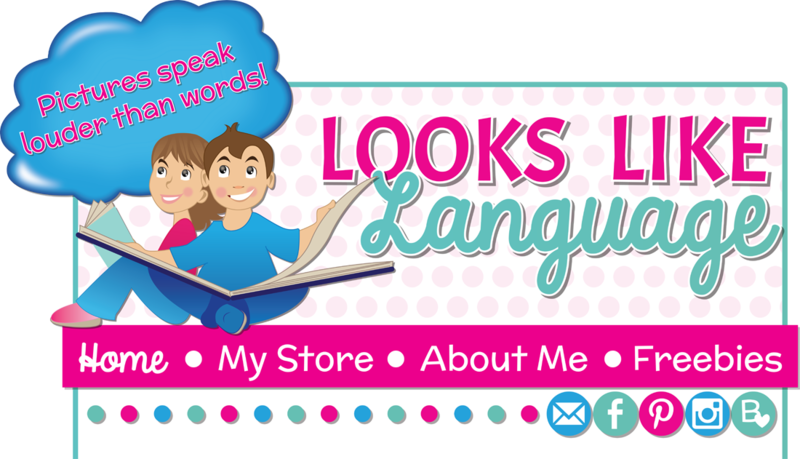 Comment here, or email me at lookslikelanguage@gmail.com, and I will do my best to help you out! Have you ever been asked for recommendations from parents about toys that are appropriate for their children to play with? For more typical students, this isn’t usually difficult. But what do you say for your students on the spectrum who don't have typical play skills? Take your student who works happily to get some play time with small cars, but then when he gets the cars he doesn’t actually play. All he does is line the cars up. Sometimes the cars are in size order, sometimes they are grouped by color, and sometimes there is no apparent pattern. Is there something we should do? And what in the world do we recommend when his parents ask us? Your student shows that he is able to categorize by features, but he doesn’t get the function piece needed for representational play. How do we change this? 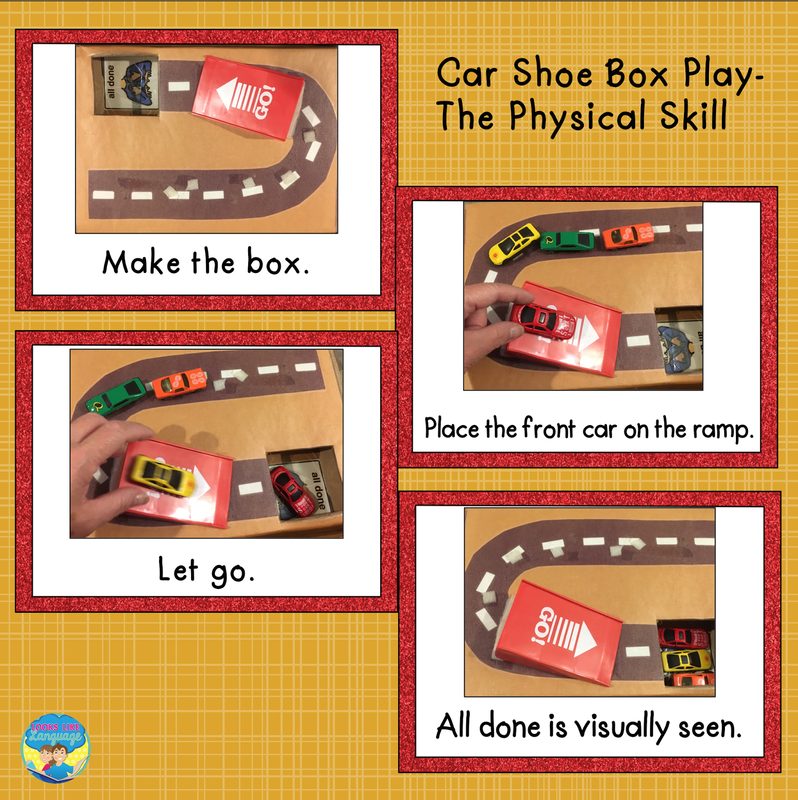 I love using shoeboxes to develop play skills for 3 reasons. 1. They make the play steps and ‘all done’ visually obvious. 2. They stabilize the toys to help with physical manipulation problems. 3. It makes one complete activity that the child can learn to do independently. 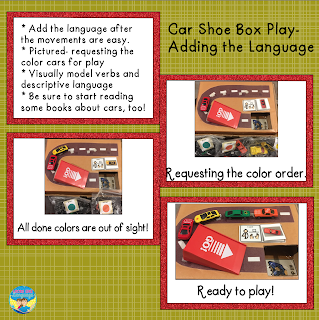 It is important to design the play shoebox so your student sees what to do and when it will be done from the visual set up. Another important piece is teaching how to use 2 or more objects together in play, since that is where make believe play begins. Remember that when you are teaching a new skill, this is work! So, your student will work on learning how to play, but will get to line the cars up however he likes once the work is done. The photo shows one possible way to teach pushing toy cars and using them with a ramp to play. 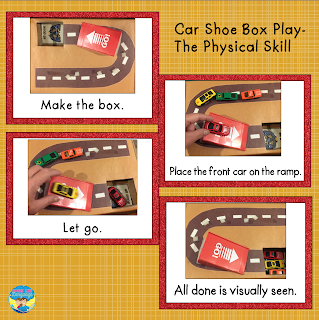 The little boy I used this with was nonverbal, with limited play skills, but he was able to learn how to make the cars go up and down the ramps on the shoebox. I faded the box by first using just the lid on the table, and then removing the lid. Eventually, he was able to request the color cars and ramps that he wanted and then play independently. You know that you have made progress when your student requests cars and actually pushes them instead of just lining them up! Don't forget to add language skills! This photo shows how I put requesting into the activity, but communication is so much more than requesting! go up, go down, go fast, go slow, stop, wait, go behind, go in front, etc. 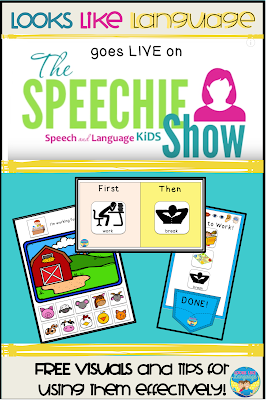 Model visually and verbally- use your student's AAC device or make symbol play boards to point to the language as you say it. Adapt some car books and expand the play to toy garages, roads and any other type of car play you can think of. But, what about IEP goals and academic standards? Now, I know that there is great pressure put upon schools nowadays to align all work to educational standards. However, if you don’t help your students develop representational language and thinking skills, how are they going to comprehend higher level academics? And if they don’t know how to play, how are they going to develop friendships with their peers? Or the turn taking skills that are a basis for so many social interactions? My feeling is that helping with the language for play and behavioral difficulties are vital to include in your work with students, no matter what IEP goals you also have to address. 1. Figure out the level of your student’s play skills. 2. Pay attention to the toys your student takes out but doesn’t use appropriately. 3. Toys your students looks at, or picks up and sets down, can indicate interest without knowledge of what to do with the toy. 1. Find out from the parents what kind of toys your student pays attention to at home, and exactly what he does with them. 2. Starting with a type of toy that is available at home has the benefit of offering more chances for carryover. 1. Buying a toy that is similar to one that your student knows how to play can be a good idea for carrying over play skills at home. 2. It is more beneficial for a student to have a toy he can play with appropriately than to buy a more advanced one that he doesn’t know how to use. 3. Consider asking a parent (who can afford it) to buy a toy that you will work on playing with in therapy sessions and send home when he can play with it independently. If you found these suggestions to be helpful, you will want to check out my other shoebox play blog post here. And don’t forget to sign up for my newsletter and get your free download of GettingStarted with Autism now! Have a Happy Thanksgiving, friends! A headache forms as you slowly head to pick up your next student. What will it be today? Screaming, running away, or throwing himself on the floor? Transitions for this child are so difficult! Ironically, once you find a way to help this child transition, therapy can actually go well! He participates and enjoys the activities you do with him. But you dread that transition time every session. In the last post, I gave you 5 questions to ask yourself to start problem-solving your students’ transition difficulties. Every student is different, so a framework for figuring it out is helpful. If you missed it, catch it here. It also helps to remember that your student is probably experiencing anxiety that he has no way to communicate. While you are working on expanding communication skills, here are some adaptations in routines that I found to be helpful. 1. Use songs and clean up routines to give a heads up for transitions when working with little ones. 2. Have young students bring a preferred object from the classroom with them. 3. Have the teacher give a heads up verbally or with their visual schedule to students a few minutes before the session is to start. 4. See if the teacher will try having students finish the current activity and sit in a waiting chair to be ready to transition. 5. Stop by on the way back with the prior student to wave and say you are next, giving them a little warning. 6. Use your photo on their schedule instead of a generic speech symbol. 7. Use a token board, just for transitioning, that lets them choose a preferred short activity when they arrive successfully. 8. Always start and end with a preferred activity to make the speech room a very preferred place. 9. Wait until they complete the current activity in the room before making a request to leave. 10. Show up to get the child with a preferred activity (or a visual for the first activity) to let them see what they will be doing first. Imagine feeling anxious about changes while having no way to communicate and no idea what will be happening next. Scary thought, right? What might you want to be saying in this situation? Even easier, what do your verbal students say when you go to pick them up and they are involved in an activity? This is a great way to decide what your non-verbal student may want to communicate. Just don't expect this to work miracles as you show up at the classroom next session with your visual for him to point to. Visuals work, but they need to be taught. How to do this? How about starting on a practical, visual level? Let your student play with one of the toys he likes. Not the most highly preferred, but something he likes. After a short time, get out the storage container for the toy and an 'all done' or 'clean up symbol' on it. Have your visual request symbol ready (ex. Wait a minute.) and prompt the child to point to it before strong emotions begin. Give the toys back, but set a timer for a minute. When the timer goes off, indicating time is up, the toys have to be cleaned up. 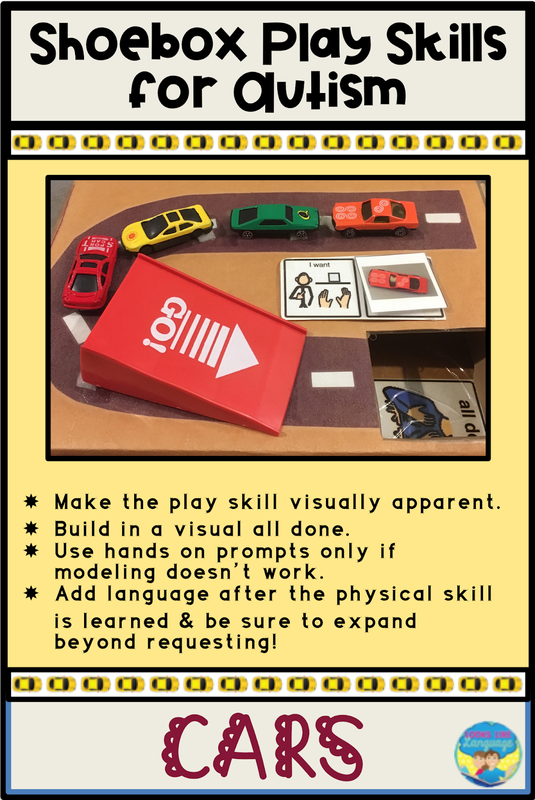 If you are using a visual schedule, or a first/then board, the toys can be an option to request again after some work is done. With enough practice in varied situations, your student can learn to ask, "Just a minute. please?" so he can finish what he is doing first. Have you tried anything else that worked? 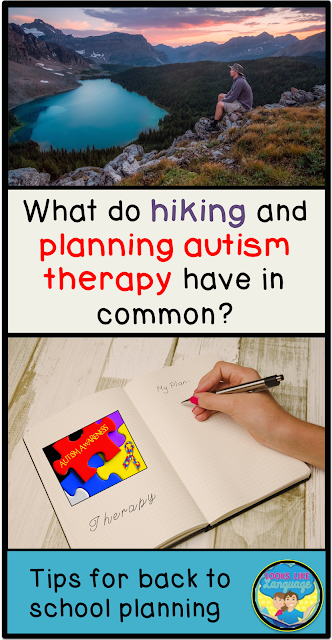 Yes, you can take lessons learned from hiking and apply them to planning goals for autism therapy! But before we get into that, let me reassure you that I am not an exercise diva. 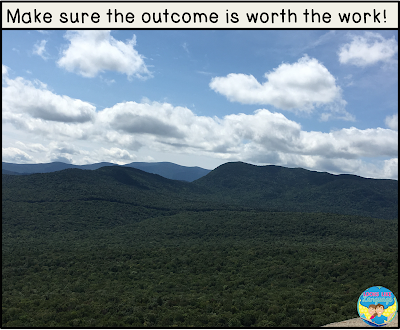 Every summer, for many years now, I’ve climbed Mount Pemi as my husband warmed up for the 4,000 footers he climbs. This year, I was pondering what I’ve learned over the years of watching my family look like nimble mountain goats compared to me. As I thought about it, I realized these ideas work for planning therapy steps for autism as well. Hiking: It is that beautiful view that keeps me going. When the climbing gets rough and I am working hard, I know it is worth it! Autism: We need to have that beautiful end goal in mind for our students to make all of their hard work worth it! Hiking: I realized a while ago that looking straight down at where I currently stood was not the most efficient way to go. Climbing works much better when I look a bit ahead, plan a path, and trust that my feet will take me there. Autism: Look at and document where the student is right now, but progress is only made when you look ahead a bit to where you want them to be, and plan a path to get them there. Hiking: On the flatter sections, I can keep a steady pace. But sometimes it gets rocky, and little steps are necessary to get me through. Sometimes, I need to look around and modify the path I thought I wanted to go on. Autism: When learning stalls, or behaviors emerge, smaller steps are needed in the activities to keep your student moving along the path. Sometimes you need to take another look at that path you planned. If it isn’t working, modify it! Hiking: I get hot and out of breath after a steep section, so I need to stop and rest a bit. While I am catching my breath, it is good to look around and enjoy my surroundings! Autism: Our students work hard for every accomplishment. After they have achieved even a small step, stop to take a break. Review some easier tasks. Stop and enjoy something fun! Hiking: Reward yourself for your hard work. Look all around to see the beautiful view and enjoy it! You worked hard to get there so don’t focus on the next mountain you want to climb. Autism: Reinforce your student for the hard work! Look all around you to figure out ways to help your student apply the skills in functional tasks. Make sure they can enjoy and use the new skill in as many ways as possible before attacking another skill. Hiking: I took a heck of a lot longer to get up the mountain than the guy I saw jogging his way up. But, my view was just as beautiful! 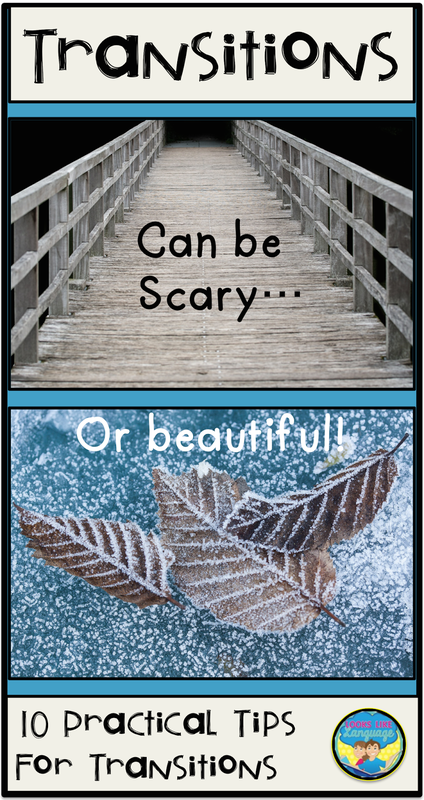 Autism: Some students need so many more steps to get to that final goal than others do, but once they can do the task, it can be even more beautiful! Finally, I wouldn’t climb a mountain if the view wasn’t worth it. Don’t make your students climb a mountain if the outcome isn’t functional and worth all of their efforts! 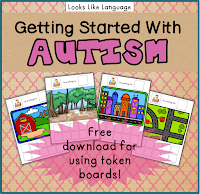 Did you get the free Getting Started with Autism Guide yet? Check it out by clicking here! Don't miss this helpful freebie! FREE Social Skills Problem Solving Unit! Do you have problems finding appropriate materials for solving problems with your older special needs students? If the level is right, the problems may be too young. If the problem is is right, there isn't enough support for the language skills. The story in this freebie is about a girl whose 'friend' picks a fight in the middle of the cafeteria one day. It is short and sweet, but allows you to address a lot of problem solving and social language skills. Try it out! If you download it and love it, please consider kind feedback as a thank you!